Fun baby shower games are one of the things I most look forward to at any party. Even the allure of food and favors pale in comparison to the fun and competitions of playing a crazy game with friends. The prizes almost always go to the guest of honor but who cares; the fun is in playing the game not in taking stuff home. We have some easy, fun and yes unique games that are easy to play and that require very few supplies for showers for ladies only as well as couples showers. As you know, entertaining the guys at a party traditionally reserved for moms only can be challenging but we have games that will ensure that the dads that come to your celebration have a blast! Go Here to See More props for party games that your guests and the mom-to-be will love. Fun loving, modern moms want a break from the everyday grind of housework and careers. What you need are a few really fun and FREE games that are fun to play. We have instructional videos for some of them, so take a look. It’s good to be silly sometimes and these games are good ways to let the guests EARN their favors and have a belly laugh in the bargain. If you’re gathering party games and activities for a coed shower, free printables might not be the game of choice. You have to bump things up a notch when you're entertaining men at a baby shower, so physically active games might work best. The trend is to assign one of the hostesses to look for free printables when we can find them (and Unique Baby Gear Ideas is here to help!) but I think action or productive games are lots of fun. I don't know about all the other moms, but when the pens, pencils and paper start passing around I have to stifle a yawn. Even the Scratch and sniff stinky diaper baby shower games just leave me cold. And Bingo? Who decided that Bingo was such a good baby shower game? I like some exercise and a little mental challenge with my games so baby charades or baby stuff scavenger hunts suit me better than what amounts to filling out baby themed crossword puzzles. If the baby shower is outside, games involving water balloons are always good for a chuckle and make excellent videos. Some of the shower games that I've seen are downright insulting to a person's intelligence. I don't know about you, but my brain didn't turn to mush the day I gave birth. After a recent round of mindless entertainment I heard some childless friends say that they would never attend another baby party ever! We have to find a happy medium in entertaining with sappy baby shower games for those of us who make babies the center of our universe and games for men or childless couples who don't get it just yet. Please, please do your best to find baby shower ideas fun and entertaining. There is so much more to hosting a successful celebration that giving your guests the opportunity to admire the shower decorations, watch the guest of honor open her gifts and eat cake. Do something that's timeless and productive! When you send the baby shower invitations, ask the guest to please bring something to tuck into the baby's memory box or time capsule. This can be a very personal letter welcoming baby into the world or anything that is time specific to the baby's date of birth. Have seedlings on hand and have a tree planting party. Designate a record keeper to map out which trees were planted, where they were planted and which friend planted each tree. What a fabulous eco-friendly shower activity. Pregnant Mama Trivia -Have each guest make a list of questions to ask the guest of honor about her pregnancy. Have someone record the answers so that they can be included in a memory book for baby. What fun for a daughter to compare her pregnancy to her mom's when she grows up and is having her own baby! Silly, goofy games are better than sitting in a chair filling out little pieces of paper and baby shower games that make memories are even better! 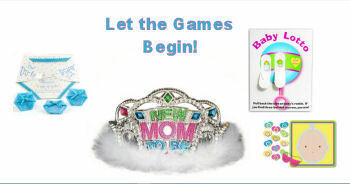 Have you played any exciting or funny games at a baby shower lately? If so, hostesses or moms who visit this website would love to know how to play! Please take a moment and share the rules on how to play the game in the form that has been provided for you on this page.